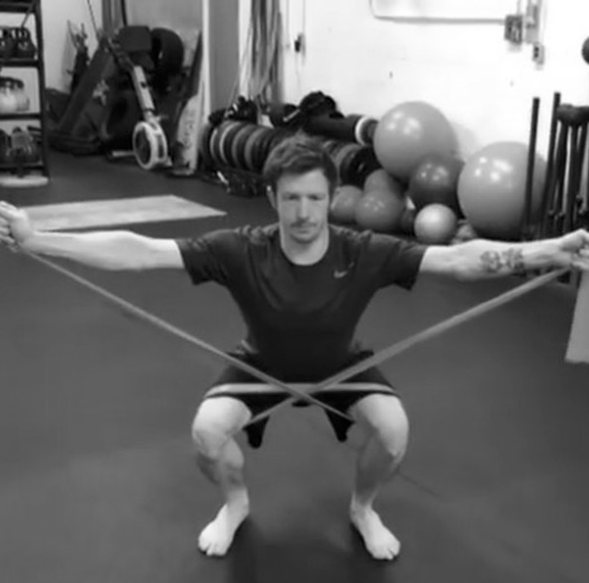 The X Band Squat is a great way to help teach you how to manage your control in stabilizing your squat mechanics more optimally. No movement is ever ‘prefect’, it is how we manage balancing corrections in the body that gives us control. The X Band pattern gives the client feedback on their corrections and where they are distributing tension. Keep in mind that no positions are inherently bad for you if trained properly. But if you don’t own a middle/neutral ground you end up compensating by creating stability at barrier end ranges of motion. (think Eiffel tower). 1-Breathing Pattern For Better Intrinsic Core Stability: (this will be discussed in another blog post as there is a lot to it) to build awareness of The 3 Point Stack. *Bonus this can also teach you where you have tight areas in your posture that you have been neglecting and need to introduce more flexibility to. Super bonus woking on your posture will help you with weight loss! Yes it’s true! Working on your deep core will have wake up all those slow twitch muscles that have been on vacation and finally let the overworked extrinsic stabilizers relax a little. As such this will build a better foundation to help support you throughout your daily leading to more calories burned and less stress on the areas of your body that always feel tight or weak. Activating major players here are key; glutes, feet, lats, obliques and serrates anterior. Use simple exercises such as glute bridges and side planks etc… One of my favourites is the Elevated Clam Shell as it incorporates the side lines stabilizers as well as hip rotation, flexion and extension. For lat & serratus anterior activation exercises I like to use Dead Bug Variations, Quadruped Holds/Crawls and Lat Pulldown & Glute Bridge Combo. These are very important and not to be missed because if all you do are exercises laying the floor to increase stability you have missed the mark in helping your body to related that information to your feet. After all we don’t roll though our day. We walk, stand, sit, jump, strut…. well you get the point. A nice little combo that incorporates all this are Palof Kneeling Press Outs, Front Loading to Split Squat and Lateral Weight Shifting. You may choose to keep the Palof for all these variations to help your client feel the feedback and better activate. But be aware that too much Plaof is not helpful. The goal in using it is to lessen the resistance more and more until the client can achieve having active foot arches, glutes and core stabilizers with no help at all. Thus making them more adaptable to the dynamics of daily life. For my next blog, I’d like to hear from you. What questions do you have relating to this piece? What other areas I can try to help you with?